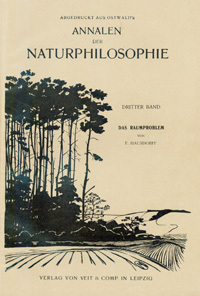 Special edition of Felix Hausdorff's 1903 inaugural lecture in Leipzig on “The problem of space”. Bonn University had two full professorships for mathematics. In 1869, Rudolf Lipschitz was the first Jewish full professor appointed in Bonn. He founded the mathematical institute, built up the library and, in 1892, successfully established a third position, enabling Hermann Minkowski to begin his university teaching career. During the Weimar Republic the mathematical culture in Bonn was dominated by Felix Hausdorff and Otto Toeplitz – both of them mathematicians with a strong penchant for cultural activities. Their families were close friends. Otto Toeplitz (1881–1940), one of David Hilbert's students who successfully continued the latter's investigations of integral equations, was strongly interested in mathematics education. In Bonn, he established a seminar and a journal for the history of mathematical sciences. After 1933, Toeplitz energetically supported a Jewish primary school in Bonn before emigrating to Palestine in 1939. Felix Hausdorff (1868–1942) worked intensively on the theory of infinite sets. In 1914, he published his ground-breaking monograph "Grundzüge der Mengenlehre" [Fundamentals of Set Theory]. Under the pseudonym Paul Mongré, Hausdorff was also active as a philosophical novelist and man of letters, publishing two books, numerous essays, a collection of poems and a well-received grotesque play. On the evening of January 25th 1942, Hausdorff, his wife and her sister committed suicide. They were facing internment and deportation to a concentration camp.